Also a fun and very hard fight. 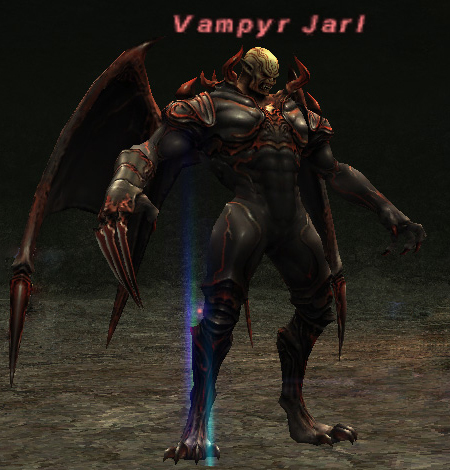 Vampyr Jarl acts in a very different manner from what we have encountered earlier inside Einherjar. Mainly what he does is that he splits up into several smaller mobs. Namely Bats and/or Hounds. All assists will single out a mob on their own, do damage to it and report in /linkshell IF it takes any damage. Once we know wich mob to hit first all others will /assist this person. After some/all smaller mobs are dead the boss will transform back into Vampyr form (with less amount of HP then pre transform) and all will start bashing him again. This transformation is stunable, so hopefully we will nail it so we don't have to chase mobs all over the arena. Chainspell Stun and fully buffed DD's to bring him down fast (hopefully).